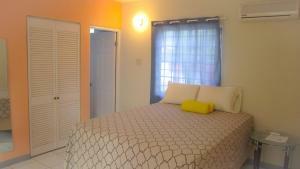 ﻿ Best Price on Kingston Paradise Place Guestrooms in Kingston + Reviews! Featuring free WiFi and a balcony, Paradise Place Guestrooms is set in Kingston. The property features views of the mountains is 24 mi from Port Antonio. Free private parking is available on site. A flat-screen TV is offered. The nearest airport is Kingston Airport, 5.6 mi from the property. If house cleaning is required, it has a cost of $15 USD per service. For guests and property safety/protection, Kingston Paradise Place does not allow guests to visit room or common areas, however your guests are allowed to visit at pool area. Guests are required to show a photo ID and credit card upon check-in. Please note that all Special Requests are subject to availability and additional charges may apply. Please inform Kingston Paradise Place Guestrooms of your expected arrival time in advance. You can use the Special Requests box when booking, or contact the property directly using the contact details in your confirmation. A damage deposit of USD 50 is required on arrival. You should be reimbursed on check-out.